One can write off the harem genre, upon hearing of it, as something that's light, fluffy, and quite cliched. While a lot of the time that is true, I've found that a specific subset of harem has proven time and time again to be the most interesting and surprising genre in anime - the visual novel adaptation. Maybe my tastes are biased. But rather it seems that the visual novel anime can combine the best of the two worlds that quite a lot of males can enjoy. One, there's a lot of girls, ranging from the buxom for those who prefer physical appeal to the moe for those with a more emotional, personality-based taste. And two, the plots in said stories quite often are quite gripping - with no evil villain overlord for everyone to join forces against, the main storylines are often character-based, whether it be pitting two people against each other or revealing the story of a mysterious character. Some may condemn such stories for being overly dramatic and "forced emotion" if not a little repetitive at times, but as one who enjoys heartwarmingly cute characters and touching stories, there really is no better genre than the visual novel. 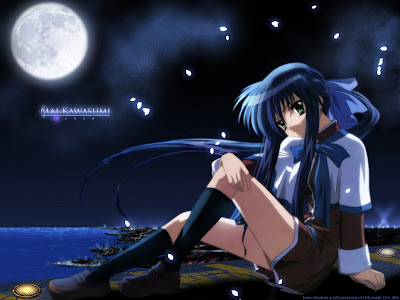 And there is no more show I can say more superlatives about than Kanon, no arc more than Mai's. Kanon is like an expensive sports car. Some people won't understand the point of it. Some might think that it lacks in usability in the everyday world, that it's overpriced, overblown, and unnecessary. Likewise, Kanon and the harem genre as a whole are rather ignored by a large amount of people. These types of shows are inherently unrealistic in a fetishizing, escapist way, saturated with moe, and liked by enough people that it becomes cool to hate it. Why watch something like Kanon when you could be seeing something that's less ridiculous and more practical, a simple slice-of-life or a comedy? And yeah, I don't mind having something like Minami-ke as a daily driver. But to me, all it takes is one turn of the key to convince me that it's worth mortgaging the house, selling my soul for a sleek machine like Kanon. That roar of the engine, the engine that screams "Uguu~", is enough to make me and many guys weak in the knees, make the heart race with a sort of moe adrenaline. There will be people who don't understand. Those who can't see the merit in having a machine that runs off of tears. Maybe they are the ones who are right. But as a visual-novel / harem fan, I live for this, and I can't imagine seeing otherwise. So, now you've herd I liek kanons. Now it's time for a justification. As much as I melt like vanilla ice cream over Shiori Misaka, Mai's arc is arguably one of the strongest of Kanon, and goes far towards showing just why I love this genre. Mai Kawasumi is your average strong and silent girl - although I could never call that just average - who sits around with her typically polar-opposite friend Sayuri Kurata. We find their interests are head-chopping, laughing, and eating lunch, in no order. Naturally, however, since this is a visual novel adaptation and something interesting has to happen, our protagonist Yuuichi stumbles upon Mai standing around school at night with a sword, which she uses to slice random almost-invisible demons that appear from nowhere to haunt the school. It's a strange thing for a somewhat strange girl to do, and we get to know Mai a little bit better over the course of the next few episodes so that when Makoto finally gets up and offs herself, we can move on to the intriguing story of the silent girl in snow. It turns out that Mai has had a feud of undefinable length with the school and the demons that haunt it - a struggle that she has always battled solo, until Yuuichi comes along. Then all the demons turn on him, or so it's said. Mai is also revealed to be less of a 'unfeeling' person and more of a 'reserved' one, made cold by the passage of time and her stigmatized reputation. Once Sayuri gets beaten over the head one too many times, we see the side of Mai she's been struggling to ignore for years, the side that feels and cries and wants to love and be loved. It's the part of Mai that has been driving her to be the protector-type she is, trying to help the people she cares about the most (all one, maybe twoof them) through her unique way of acting, which often involves her taking too much blame on herself for the common good. And so you would imagine a lot of Mai's arc involves some sword-swinging and some opening up of Mai to becoming a warm, feeling person. You'd be kind of right, but on the whole mostly wrong, because the 15th episode of Kanon comes along and flips things on its head a few times before all is said and done. The long night starts with Yuuichi and Mai fighting the demons in school at night. It's been already stated to be The Night, where the threat is eliminated once and for all. And for the first ten-odd minutes it's pretty much that, as we get some sword-slashing, some smashing through windows, and general action stuff. And then the final blurry CG demon is vanquished. Rejoice, all is well! Actually, it turns out there were more demons, and one of them sends Yuuichi into the way-back machine where he learns that Mai's mother is dying. Actually, it turns out that Mai's magical power is to heal things with her tears, a power that sounds great but gets her ostracized by the typically conservative community. She lives a sad life until some random kid named U1 or something comes along and makes everything great until he has to leave to go be pimp with some taiyaki-eating girl. Yuuichi figures out eventually that that person is him, and takes it upon himself to connect the dots for Mai, so that they can live peacefully and happily again. Mai, in fact, is so joyful that she stabs herself to death. It turns out her inner character, Hope, was living inside her all along, trapped inside her stone-cold attitude. Deep down she was still a real, feeling girl who wished for things, that hoped for things, that wanted to have fun, that wanted to laugh, that wanted to smile. This girl, is what stops me from throwing my computer out the window Kanon from becoming a tragedy, and instead paints it as an extremely emotional, intense story. Maybe it's something that can't be conveyed in a half-humorous, five paragraph summary, but this episode and Mai's arc are really something to me. It has all the little elements in it, all the little touches of steady foreshadowing and character development. The lines like Mai's "stay close to me...you'll work as bait" that serve as humor but also get played off of as signs of how much Mai has grown as a person who can trust others, the hints of the underlying ability of Mai (with the sword, the demons, and finally, the graying skin), and above all, that sense that you have all the pieces of the puzzle, you just can't put it together. I mean, it's a testament to the dramatic power of a show that Kanon can convince me that Mai's mom was going to die, despite the fact that Sayuri mentioned that "Mai lives with her mom" just two episodes back. The small details like that that make it sound so obvious, make second rewatches that much more enjoyable. This episode was wall-to-wall edge-of-your-seat watching in one way or another, from the high-energy action sequences, to the intriguing reveal of Mai's hidden power, to the absolute double-stunner at the end. I don't think I breathed more than twice. And Kanon opens itself up to questions, discussions too. It's not the kind of glaring omissions that break a show but rather smaller details, that could be debated on endlessly, that give a testament to the underlying depth of the show, the motivations of a character. Does Mai remember Yuuichi? Is she secretly hiding a grudge against the man who doesn't seem to remember the past, or is she honestly experiencing being cared about for the second time (Sayuri aside)? How long have the demons been around? Has Mai really been fighting all these years? Or is it something that's resurfaced with the reappearance of Yuuichi? What 'control' does Mai have over her demons? Why do they attack Yuuichi - or do they? Is it intentional? Could Mai just want to be the hero that protects Yuuichi, protects Sayuri, that saves the day? Don't feel forced to answer these; a large amount are hypothetical. After all, a lot of these questions can never be truly answered outside of community agreement. But the fact that a somewhat simple storyline, with a few twists, can spark such almost high-level discussion - especially if you start talking about Mai's actions and her reasoning behind them - is something that really endears me to these kinds of shows. These character-driven shows, with personalities that are part dynamic and part adorable, offer a feast for the inner analyst, the romantic, and the viewer who just wants a enrapturing story, all in one. 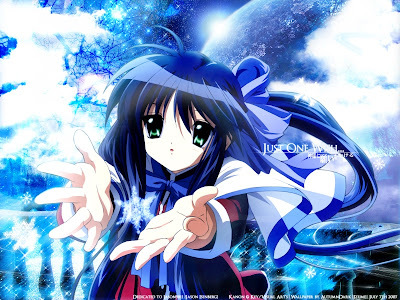 And Kanon, one of the original character-driven (rather than hormone-driven) visual novels, is brought to new heights in its 2006 adaptation. I can not really say enough about it other than "watch it" if you like sweet and emotional romance / drama anime. If I had one show to unabashedly rave about for the rest of my life, it would be Kanon, the first love that encompassed me. This entry was posted on 12/22/2007 10:07:00 AM You can skip to the end and leave a response. A passionately-written entry, serving to remind those of us who can take or leave (in my case, leave, leave, leave) Kanon and its ilk that there are good reasons for its popularity. I prefer to call this sort of thing a 'fanboy paean', not a 'fanboy rant'. And now, if you'll excuse me, I'm off to watch something non-Kanonical. Lovely post. I must say, though, that it isn't just males who love Kanon; some of us girls are big fans, too. Could Mai just want to be the hero that protects Yuuichi, protects Sayuri, that saves the day? Funny, I actually rewatched episode 15 today before stumbling upon your entry. Indeed, Mai's story was the most well crafted (IMO), with the most psychological complexity. The telling of her past was incredibly well done; the confrontation between her and Yuuichi in the end sent goosebumps up my arms. Since I have nothing better to do right now, I shall attempt to answer the hypothetical questions you've posed with my own interpretation. "Does Mai remember Yuuichi? Is she secretly hiding a grudge against the man who doesn't seem to remember the past, or is she honestly experiencing being cared about for the second time (Sayuri aside)?" Mai did remember Yuuichi as a child, but didn't know that the older Yuuichi was the same person as the boy who left her 7 years ago. You can argue that subconsciously she might have known, but consciously she thought of the older Yuuichi as a different person, up until the point when Yuuichi confronted her. "How long have the demons been around? Has Mai really been fighting all these years? Or is it something that's resurfaced with the reappearance of Yuuichi?" I believe the demons/monsters started appearing right after Yuuichi's phone call telling Mai he's leaving. At the time, the demons were the demolition tractors that ate away the field they played in. Eventually they transformed and materialized from Mai's power, fuelled by Mai's self-hatred. Mai had probably been battling her own monsters all these years, but the intensity of the battles might have increased with Yuuichi's reappearance (Freud would have a lot to say about Mai's repressed memories lol). "What 'control' does Mai have over her demons? Why do they attack Yuuichi - or do they? Is it intentional? Could Mai just want to be the hero that protects Yuuichi, protects Sayuri, that saves the day?" The demons didn't just attack Yuuichi. They also attacked Sayuri and Mai herself. I don't see Mai's intention to be "protecting her friends and being the hero". Rather, the demons were a direct manifestation of her self-hatred, which appeared when she thought her powers were what drove Yuuichi away. Since then, she started literally attacking the side of her that she despised the most, all because of a simple misunderstanding that happened 7 years ago. Mai's story really puts a new twist on the phrase "Your biggest enemy is yourself". what asuka said was correct but i think the demons tryed to contact yuuichi and this is y the demons tryed to attack him.....to try to help mai and to stop the endless fight between the hatred of mai's powers....also to find the answer to whats missing in yuuichi's mind seven years ago since he is the *key* into stopping all this.